2. We do what we say, when we say, at a high level of quality. In 2012 P.M. D'Onofrio started its largest project to date: the Spring Mill Apartments. Taking over a year to complete, this 385 unit apartment complex required over 16,000 cubic yards of concrete. 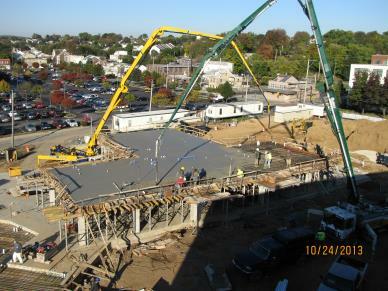 PMD poured over 300,000 SF of slabs on this job, half of which were shored slabs (as seen below). Above: This large transfer slab pour required two pump trucks. Left: This 24' high wall features a sloped corbel to receive a precast plank above. 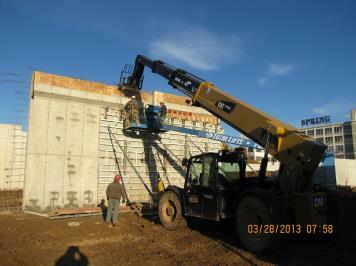 In all, this project had over 5,300 LF of cast in place concrete walls. 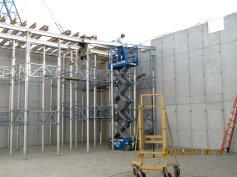 Below and Left: an example of the shoring system used to support the over 150,000 SF of transfer slab on this project. The image below also shows a two-story high shored slab section which required us to stack the shoring towers on top of each other.